I’m making preparations for my third trip to India at the moment (I was there on an after-army trip and a long trip at the age of 30). I’ve tried to decide which medications I should take with me, then remembered all the illnesses I’ve caught in India, which helped me decide what I need with me this time. 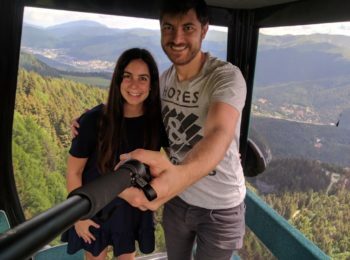 Since I’ve got plenty of expertise in the area, I decided to channel it into the blog and write an extended post about things you should bring with you when planning a trip to this wonderous country. Let’s start with the worst thing (That I had) – Scabies! Yes, it’s not a military urban legend. It’s a real disease and I wouldn’t wish it on my worst enemies. It’s an extremely itchy disease and you need to be aware that it might appear while you’re in India. Fortunately, my disease appeared after I’ve returned home (It only physically manifests after a month) and the next day I got it treated. Treatment itself is very simple and it’s just a cream you rub over your entire body. This disease is very contagious, so it’s important to identify it quickly or you might infect people around you. You have to wash the clothes and bed sheets you’ve come in contact with. How to identify scabies? A crazy itch all over your body!! And you see small holes in your skin that look like borrows. How to treat it? A cream spread over your entire body. Treatment is based on a cream which contains Permethrin (Commercial name: Lyclear) at a 5% concentration and kills the mites. Amoebas in the stomach. This is actually a disease which followed me for three months on the trip. I think most people get it in India and you just need to be prepared that it might happen to you as well. It’s unpleasant and can mess up your trip, so you should bring an antibiotic treatment with you just in case. How to identify dysentery? The description is quite disgusting, so you’re invited to read about it on Wikipedia. How to treat it? The first thing is to drink a lot of water (To avoid dehydration), the medicinal treatment is antibiotics, but you need to fit it to the type of bacteria. To treat an infection by the Shigella bacteria you may use several types of antibiotics, like Ciprofloxacin or Azithromycin and to treat amoebic dysentery you may use an antibiotic called Metronidazole. When I flew to India after the army, I’ve had some pretty severe asthma attacks. Since we traveled on a very low budget, we mostly stayed at places with a rather low level of sanitation (We’ve even found mold in our rooms a few times). If you have allergies, sensitivities or chronic illnesses – I recommend staying at rooms with a high level of hygiene, even if it costs you a bit more money. I’ve suffered of that, too. Honestly, I don’t know how it happened, since Roman and I ate the exact same things, but I guess I’m more prone that he is, and was taking a food supplement at the time which must have been a bad combination with the Indian food. I’ve had horrid stomach ache like I’ve never felt before. How to treat it? Go to the ER. I’ve had such terrible pains, we had to call an ambulance. At the ER I received an infusion and had many tests done. After a few hours I was discharged, and everything was fine, but I highly recommend not ignore strong pains. I tried to ignore the pain for a whole day, but as I saw that it kept worsening over time with no improvement to be seen, I had no other choice. Didn’t happen to me, but to a good friend I was traveling with. She drove on a bike with a local guy who’s been driving his whole life, but sometimes you get unlucky and he slipped on the road. My friend suffered severe injuries to her leg and was hospitalized for a month at a private hospital in Delhi. I don’t have much to say about this type of situation, as accidents may happen (Even if you avoid riding on a motorcycle). My recommendation is to make sure you have good health insurance. My friend was lucky to have good insurance and it paid for her entire stay at a private hospital, which has really high expenses!! Let’s just say… If you do have an accident in India, it’s better to go to a private hospital. A post I’ve written about my recommendations regarding travel insurance. As you can see, you need to prepare for an India trip in terms of medicine and insurance. So, I’ve prepared a list of all the medication I recommend for you to have with you, but of course you should visit a travel clinic and consult a doctor for his recommendations, as well as checking which vaccines you should get before the trip, depending on the areas you’ll be traveling in. I personally recommend bringing many medications despite probably not using most of them. It’s always better to be overly prepared. I do, of course, recommend not taking medication like antibiotics on your own. Nowadays, most HMOs have the option to correspond with a doctor, and many different insurances allow you to chat with a doctor. What’s important is to consult a doctor and tell him about your symptoms. Allergy pills – You may encounter allergies in a foreign country which you weren’t very aware of, it’s always good to have allergy pills with you, some don’t require a prescription like Allergy. Altitude pills – for height sickness. Be aware, this is a pill you really shouldn’t take without good reason, even if you are at quite a high altitude. A friend of mine and I took them while going on Manali mountain and the side effects were unpleasant. I recommend having the pill with you and only taking it if you feel like you need it. Natural remedies for nausea – The rides inside India can be rough and cause nausea. I recommend having natural remedies to take a day before the ride/during it. It helped me a lot. Pills for fever and headaches – Always good to have some with you, such as Ibuprofen, Advil or Acamol (Paracetamol). Depending on what you’re used to taking.